November offers some great outdoor opportunities with good footing and expansive views without the leaves on the trees. This was one of those days. Only the sunshine was missing. 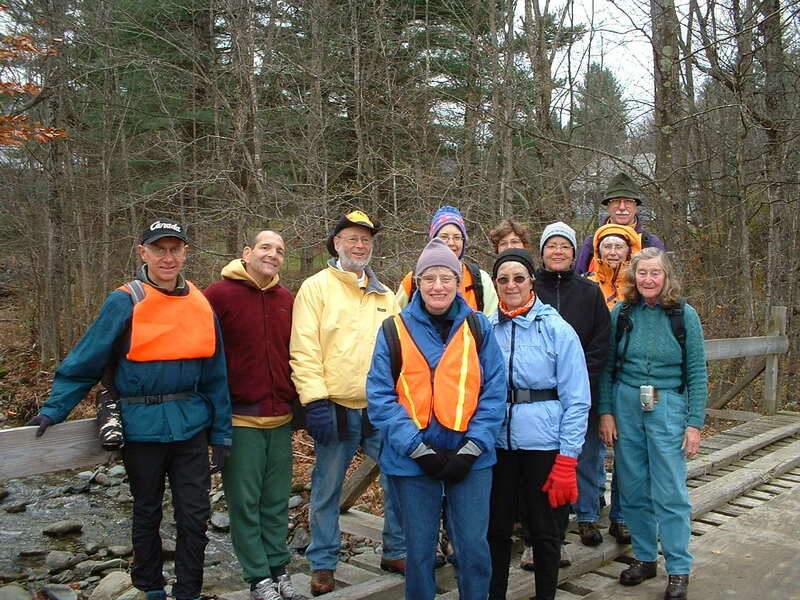 Our trailhead for the Mad River Greenway was convenient for both the walk and to Route 100. Nine of us carpooled from Montpelier (very efficiently in two cars), and three more folks rounded out our nice group of twelve. The Greenway is a natural mowed path with a slightly worn single or double track trail. For the most part, it is directly beside the Mad River, and offered benches and scenic views along the way. Notice boards at one point had an informative page of nature notes for the month of November. We saw a few other walkers and a couple of dogs, but for almost our entire 5.3-mile walk, we were the only folks around. A short road walk going through the Pine Brook covered bridge almost returned us to the trailhead. We ended with the stick of the lollipop route, thereby walking the entire leng th of the Greenway. The path was a new discovery for all but one, a positive addition to our personal local walking repertoires. It was a refreshing, social and easy mornings walk, with a return to Montpelier by 1:15 and a free afternoon. You can find this and other Mad River Valley walks and hikes of all levels on an excellent Mad River Valley map and guide put out by Map Adventures. It includes Long Trail hikes from south of Lincoln Gap to just north of Camels Hump.